Volunteers and Servants needed to serve! 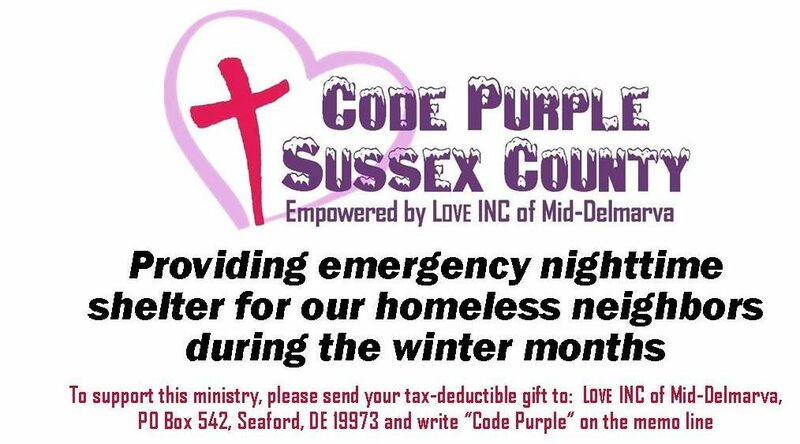 Please consider volunteering your time, love, and talent to Code Purple Sussex County. Please complete the Volunteer Form and call us to talk about the opportunities! There will be training available at each site before the season begins. Online Calendar: Please use our online volunteer calendars to sign up for the site and position that you would like to fill. They can all be found on our “Volunteer Site Calendars” Page. Click the appropriate link on that page to go to our calendars. We may not be open on all the dates that are listed. We will review the weather and cancel dates accordingly. Those days are listed as ‘On Call’. Overnight Shift: Each shelter has its own opening and closing times. The general times are 8:30pm to 7:45am. Arrangements can be made to come in later and/or leave earlier. Just need to make comments to the volunteer coordinator. Dinner: Dinner includes the main dish, bread, and a dessert or veggie if you wish. In the past, most have also brought tea, milk, or soft drinks. Please invite your family and friends to assist you with this. Also, service groups will receive service hours for this, just let us know so we can sign off on the hour sheets or write a letter. We appreciate you taking on this service and we do want to have variety in the meals served. It’s hard on our guest’s stomachs to have red sauce repeatedly. In the past, we have served meatloaf with mashed potatoes, chicken n dumplings, hot dogs with chili, chili, a variety of soups and stews, taco night, pizza, cold subs or sandwiches, meatball subs… Please call ahead to ask for our headcount of our guests to determine quantity. Please list the main dish and items you plan on bringing. Contact Kaytra MacDonald at 302-853-0129 (Seaford location) or JoEllen Kimmey at 302-632-7988/jkimmey70@aol.com (Milford location) for headcount and meal planning questions. Intake: Arrive to set up for intake, duties to include: intake form completion, boundaries sign off, and guests bags checked in. Morning Relief: You will need to ensure that the nightly chores were completed and any follow up cleaning if necessary. Also, an inventory list for replenishment of supplies to our supplies coordinator. AM/PM Transportation: Volunteers needed to transport our female guests from the meal sites in Seaford and Milford to the women’s shelters in the evening. Upon checkout in the morning, the ladies need to be taken back into town. We are currently in need of two 15 passenger vans to assist us. We encourage volunteers to fellowship with our guests. We encourage you to pray on other ways to serve our guests like a short bible study, G.E.D. training and study help, job search and training, life skills, budget planning, and other areas that you may have as a special skill. We also need help from our community in ways of haircuts and other grooming services.